Colie expects the worst when she's sent to spend the summer with her eccentric aunt Mira while her mother, queen of the television infomercial, tours Europe. Always an outcast -- first for being fat and then for being "easy" -- Colie has no friends at home and doesn't expect to find any in Colby, North Carolina. But then she lands a job at the Last Chance Cafe and meets fellow waitresses Morgan and Isabel, best friends with a loving yet volatile relationship. Wacky yet wise, Morgan and Isabel help Colie see herself in a new way and realize the potential that has been there all along. I have a few confessions to make before I write any further. One, this my second book by Sarah Dessen. I am embarrassed to admit it, but it's true. Second, This book is been sitting on my shelf for the past 4 - 5 years. Again, total embarrassment. 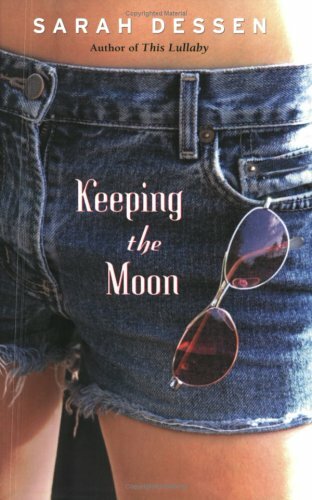 Keeping the Moon is about Colie, who never really had any friends. Because of all the moving around she did as a child and because she was overweight. The story starts when Colie is send to Colby, to her aunt for the summer. She is forty pounds lighter but still very lonely. Her mother is the queen of workout infomercials and is away a lot of the times. Colie is not looking forward to the summer and expects the worst out of the situation. Little did she know, that this summer will change her forever. Keeping the Moon was a short and easy read. The story was inspiring and beautiful. The characters were very interesting and different and the writing was just brilliant. I cried a lot reading this book. It was very touching and powerful. The book was written in 1999 but it has such a timeless feel to it. The writing was brilliant and compelling. The character were very unique and original. Norman was not the handsome boy next door and Aunt Mira was so eccentric and fascinating. I love the camaraderie between Morgan and Isabel. Morgan was naive and sweet. Isabel, on the other hand was tough and witty. Their friendship was cute and funny. Colie, as the protagonist was awkward, insecure and quite. Which made her very relatable. The book made me laugh and cry alot. There was nothing really bad with the book but, it gets predictable at times. Morgan's plot was a wee bit too dramatic for me. Favorite Character: Colie, Norman & Isabel.